They say that the media is for the people, so who ya gonna call when in crisis? 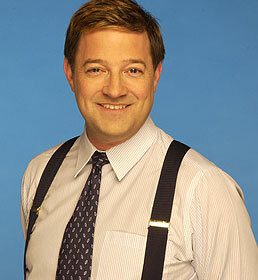 Certainly suspender-wearing hero Kevin Frankish, host of CityTV’s Breakfast Television! At about 6:30 this morning, early-rising DIY-afficionado Lori Darosa of Oakville began painting an upper room in her house, when—oh, the humanity—she locked herself into the room while her husband Ned slept out of earshot elsewhere in the home. Devoid of doorknobs or lavatory facilities but in possession of a computer and television, the damsel in distress leapt into action MacGuyver-style and banged-out an email to the dashing television host, pleading for safe egress from her unexpected prison. Frankish—a true Samaritan—dialed the oblivious, sleeping husband on-camera, who was then able to extract his true love from the jaws of jeopardy with a chivalrous flair. Pure Harlequin romance novel…we just may cry! Matters of urinary urgency, relayed messages to spouses and otherwise quirky news can be sent to [email protected], though we’re slightly less heroic.